I’ve always been fair-skinned. It’s one of mom’s “hand-me-downs” that she’s most proud of—so proud that whenever I come home from abroad or an out of town trip from the beach, she never fails to let me know how she feels about my newly-acquired tan. Let’s just say she’s not too pleased about it. I get it though. (I really do, mom. Cross my heart.) As much as I love to tan, I love my fair skin as well. More importantly, I want an even skin tone, which isn’t really easy to maintain when you spend a lot of time under the sun. 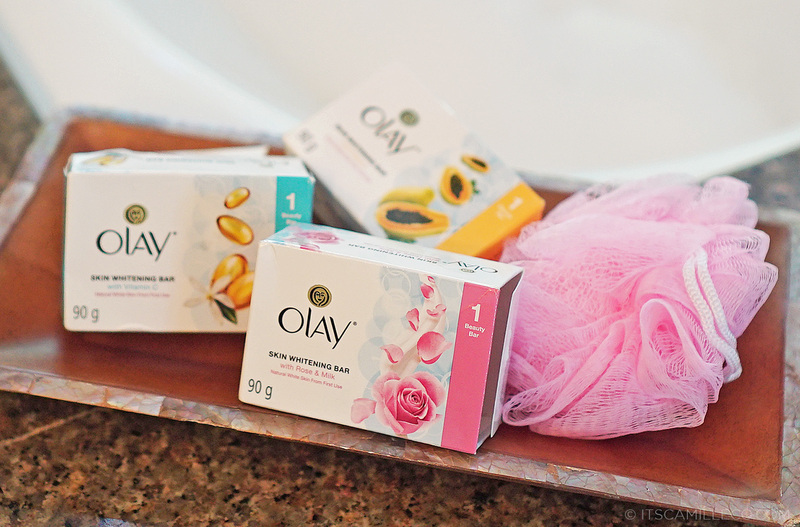 This is where Olay’s #OneWashWonder comes in. Yes, you read that right. ONE. WASH. WONDER. I was actually quite curious when I received Olay’s invite for its launch event. I mean, really? ONE WASH? Not two? Not three? Just ONE? How is this possible? What is this conspiracy?! I didn’t have to wait much longer to find out what it was. And despite my excitement, it was definitely no conspiracy. Last April 19, the World’s No. 1 Facial Skin Care Brand Olay unveiled its new Olay Skin Whitening Bar to beauty enthusiasts at an exclusive preview at VASK, BGC. We were all treated to delightful food, overflowing drinks and even an on-the-spot, straight-from-camera-to-print photoshoot with photographer Sara Black. For a short moment there (a quick 2-3 minutes to be exact), we all felt like a star, doing the famous Olay pose in front of the camera. But the true star of the event was really the new Olay Skin Whitening Bar. It’s said to have a Triple Whitening System that gently exfoliates, brightens and evens skin tone, and contains 90% of the active ingredient found in Olay Natural White Day Cream. So why One Wash Wonder? Because with the new Olay Skin Whitening Bar, achieving fair skin is no longer a long and tedious process. 8 out of 10 Filipinas agree that the new Olay Skin Whitening Bar helps to whiten skin from the very first use! More than its proven efficacy, it is also dermatologically and clinically tested to be gentle on skin with naturally-derived ingredients like rose, pearl and milk extracts. No more pain. No more stinging sensation. Of course, I just had to give it a try! It has been more than a week since I’ve started using the Olay Skin Whitening Bar. And so far, so good! Although my skin hasn’t gone back to its original fair complexion yet, it definitely evened out a whole lot more. To be fair (no pun intended), it’s important to note that I’ve been going on a lot of beach trips lately so my skin would’ve become fairer if not for these trips. Aside from the soap’s effectiveness, I really love its scent as well. It’s very feminine but not overpowering and lasts quite a long time. A rich lather of it leaves my skin smelling good plus feeling soft, smooth and moisturized. But is it a #OneWashWonder? Let’s just say, I’m a believer. Olay Skin Whitening Bar is available nationwide in Rose & Milk, Vitamin C and Papaya. The 60g bar is PhP 34 and the 90g bar is PhP 46. Safe po ba gamitin to ng mga 13 year’s old? Hey, anong magandang lotion ang pweding ipartner dito? Yung whitening but also moisturizing? I haven’t tried partnering this with any pa though. The rose variant worked for me. Paano kung maiitim na singit at batok? makakaputi kaya? Hi. Is it okay if I use it everyday? Usually, I use whitening soap every other day. It’s not harsh so yes! Is thia okay for Kids? Ya Know! I want to know if its okay with kids! For all the reviews that recommended for healthy living. some skin whitening foods can help in the change in your skin. such as fruits and vegetables. Broccoli and blue fish in skin whitening. Camille, my sis in law will be going to the Philippines this month. Is there an effective face product you would recommend for acne scars (texture and pigmentation) that is still gentle/hypoallergenic on the skin? I thought I’d put the comment here instead of the past blogs where you talked about facial skin care since I’m not sure how often you check the old ones. Oh, and I already told her to get me this Olay soap as well! :) Thank you so much! I have to agree. A great tan is good but an uneven skin tone can really be a nuisance. This skin whitening bar sounds so good! :) I definitely want to try it, but I’m pretty sure they don’t sell this in the US just yet <3 I feel like all of the good skin whitening products can be found so easily in Asia, but it's harder to come by in the US :( Hahaha thank you for your review Camille! Oh really? We definitely have a lot here! Haha is a 16 yrs old allowed to use it po? Btw that’s why you’re so prettty!!!! !